Datatrax® provides data accessibility: Manage "To Do's", record follow up Calendar Ticklers for Advertiser and Agency Contacts, enter Notes by unlimited user-defined types (e.g. Advertiser Account Special Instructions, Materials Tracking, Source and Proof Notes). Once Orders have been entered, access additional standard features of Datatrax®: Production Status, Order Status, Contract Status, and more... you can even view a thumbnail of the ad! 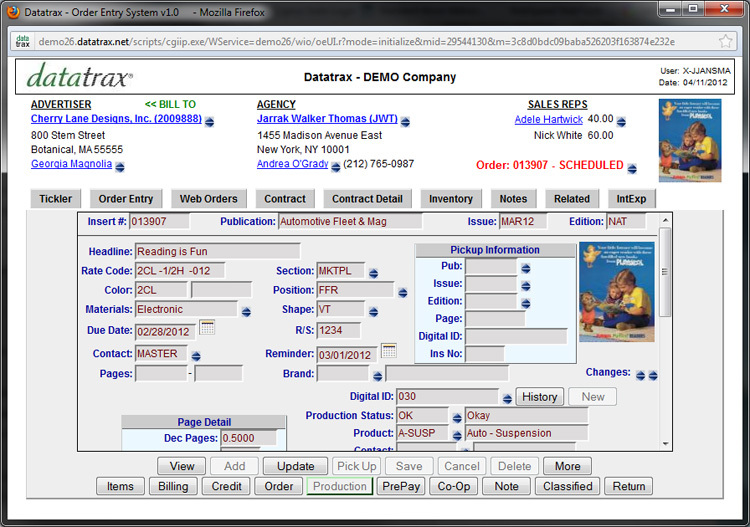 Datatrax® has customizable, user-defined fields for specialized tracking on Orders. For example: Requested Position, Ad Changes, and Competitive Separation. Production data can also be directly interfaced via export and/or import with third party page layout and composition software applications.